Feast your eyes on the ultimate 308. 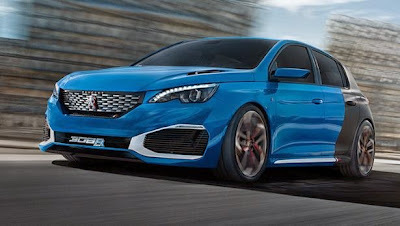 PEUGEOT has unveiled a stunning new version of the compact family hatchback – with a combined 500 bhp and four-wheel drive. Badged the PEUGEOT 308 R HYbrid, it has been developed by PEUGEOT Sport, the brand’s famous in-house engineering and racing division, which last year unveiled the critically acclaimed RCZ R. The car’s plug-in petrol hybrid powertrain results in a car capable of hitting 62mph (100km/h) in 4.0 seconds, yet still has astonishingly low CO2 emissions of 70g/km. At the heart of the PEUGEOT 308 R HYbrid is a plug-in powertrain with four-wheel drive that develops 500hp. The unit combines three sources of power, each capable of moving the vehicle independently of the others. They are a four-cylinder 1.6-litre THP 270 S&S petrol engine, plus two electric motors – each with power of 85kW/115hp – mounted one on each axle. The front one is linked to the six-speed gearbox. The all-wheel drive system of the 308 R HYbrid makes for formidable handling, especially when coming out of the corners. The braking system is on a par with the car's performance, with 380mm ventilated discs at the front, gripped by four pistons, and 290mm discs to the rear. However, they are not used every time the brakes are applied, because PEUGEOT Sport has designed the powertrain to decelerate using the electric motors throughout the full speed range, starting at 155mph. Not only does this preserve the discs and pads, but uses regenerative braking to recharge the battery.